San Dimas Station is advising us of another bear sighting in La Verne tonight, Thursday, June 14, 2018. The caller reported a momma and baby bear were roaming around the driveway of her residence at around 9:17 p.m., on the 4500 block of Live Oak Canyon Road. 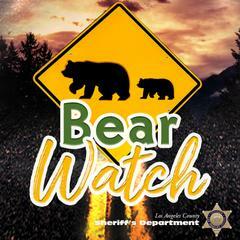 Deputies responded to the location to assist the female adult caller with a bear sighting near her home. The frightened resident retreated to the attic to protect herself until help arrived. Deputies were able to gain entry into the residence, search the home for bears, and then help the woman down from the attic once no bears were located. The woman did not report any injuries related to this incident. 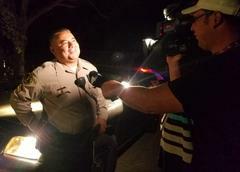 A search for the bears in the surrounding area outside the home met with negative results. There is a canyon behind the home that the bears may have re-entered. This encounter was a very frightening sight for the homeowner since she is new to the neighborhood. Do not toss food scraps out into the yard. Purchase and properly use a bear-proof garbage container. Wait to put trash out until the morning of collection day. Do not leave trash, groceries or pet food in your car. Keep garbage cans clean and deodorize them with bleach or ammonia. Keep barbecue grills clean and stored in a garage or shed when not in use. It is advised to not hang bird feeders in bear country. If you must, only do so during November through March and make them inaccessible to bears. Keep in mind bears are excellent climbers. Do not leave any scented products outside, even non-food items such as suntan lotion, insect repellent, soap or candles. Keep doors and windows closed and locked when unoccupied. Consider installing motion-detector alarms and/or electric fencing. Bring pets in at night. Provide safe and secure quarters for livestock at night. Consider composting bins as opposed to open composting. Securely block access to potential hibernation sites such as crawl spaces under decks and buildings. Do not spray bear spray around property – when it dries, it can serve as an attractant. If a bear breaks into your home, do not attempt to confront the bear. Give the bear an escape route. If the bear cannot make its way out, go to a safe place and call 911. And/or, in the City of San Dimas, Code Red or the Code Red mobile app. The San Dimas Booster Club was established in 1991 to provide a means to raise money for the needs of auxiliary personnel and volunteers who work at the San Dimas Station. The Booster Club has provided thousands of dollars for the purchase of equipment and supplies and to provide specialized training and education to volunteers. Virtually all of the funding for these programs is through the efforts of the Booster Club, as neither the Sheriff’s Department nor the County of Los Angeles provides a budget for these services. The San Dimas Sheriff’s Booster Club continues the proud tradition of meeting the needs of the volunteer/reserve program at the San Dimas Sheriff’s Station. The Booster Club consists of people like yourself - residents, merchants, and business owners - who band together to make a positive difference in our community. The Booster Club members and the Board of Directors are very proud of their accomplishments and invite you to join them in making this important program even more successful. Please visit our website at: www.sdmsheriffsboosters.org.